In real life, there's not always a good place to tie your horse when you need one. And sometimes you just don't have time to tie up. 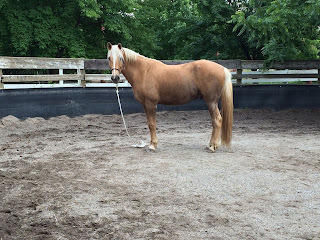 In situations such as these, it's good to teach your horse to "ground tie"
When I was looking up advice and techniques for how to teach Apollo this skill, the typical way of doing it is to hide a stake or other implement on the ground and tie to that. The horse is supposed to then learn that when his rope (or reins) are dropped, he is tied... and not question it. This approach presented two problems for my own training situation. First, I don't think the boarding stables would like me installing a ground tying tool. Second, and more importantly, I'm pretty sure Apollo would figure out he was only tied when I fuddled with something on the ground. He likes to test everything, and I am certain he would learn how to tell the difference between being actually tied and just having a rope dropped on the ground. As I discussed in the post Mind Over Matter, training tools and forcing or tricking a horse can get the job done, but I think it is better if the horse cooperates willingly. With this mindset, I have been training him to ground tie without actually tying him to anything. First, your horse needs to stop when you say 'whoa.' Actually, that's not accurate - Apollo only stops most of the time, but he at least understands what I'm telling him (even though he still sometimes ignores me). But the horse should be in a good frame of mind when teaching this: paying attention, not too distracted, wanting to learn and work with you. Start with halter and lead rope on the horse. Holding the end of the rope, tell your horse "Stand" (or your command of choice for ground tying) and back up. If your horse tries to follow, encourage him to stand still by blocking his forward motion with a Parelli carrot stick, lunging whip or similar. Over time you can go further and further away, and do it without a halter and lead rope. If your horse likes puzzles and games, or gets bored or impatient just standing still, here's one you can play to get them thinking about the task of ground tying. First, you'll need to train your horse to come by verbal or non-verbal command. For Apollo, I put my hand on his nose, and then walk away with my hand down and palm open like offering a treat. Once he comes when called and will follow without a lead rope, you're ready for the game. Walk away from your horse, telling him to come with you. Stop and indicate 'whoa.' Walk away again but this time tell him to stand still. Circle around to return to his head, and when you get to him again, tell him to come. Alternate 'come' and 'stand' while walking with and without your horse in various patterns. Always return to his head before changing from one to the other command - you want him to act as if he is tied and waiting for you to 'untie' him, and not try to come to you when you're far away. With practice, you will be able to do this over greater distances, obstacles, with distractions, etc, and simply by a few hand gestures.